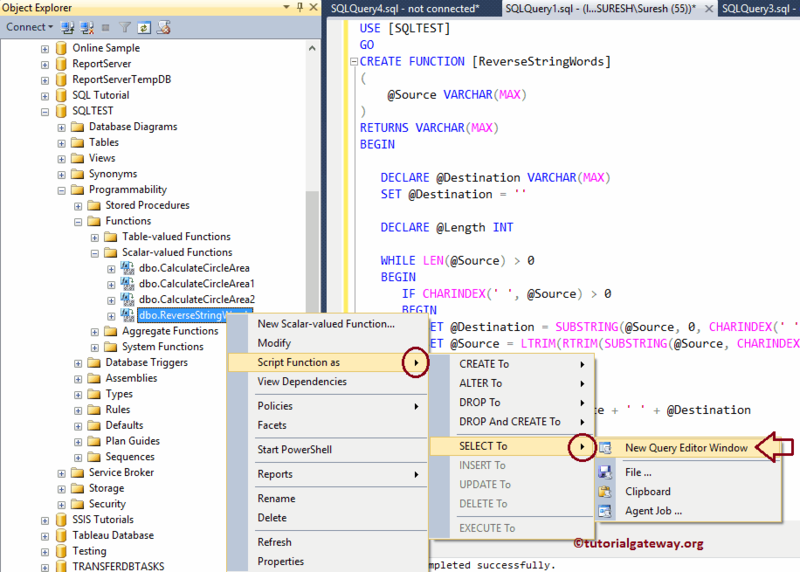 In this article we will show you, How to write a SQL Query to reverse each and every word present in a string with example. This is one of the common SQL Interview Question you might face in the interviews. 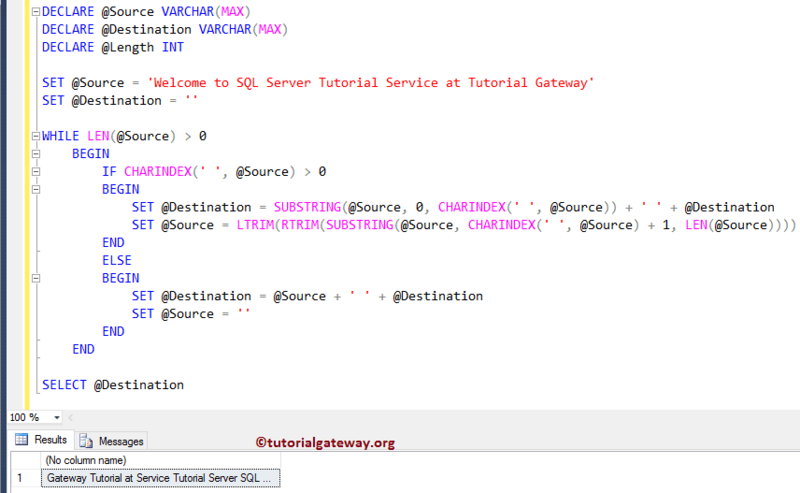 The SQL SUBSTRING Function allows you to extract and display the part of a string. In this example we will show you, How to Select string before the space symbol. First we declared three variables using the DECLARE statement. Next we used the WHILE Loop to iterate each and every character present in the @Source. For the condition inside the while loop, we used the SQL LEN Function to check whether the length of the source is greater than 0 or not. Next, we used the starting position as 0. Next, we used the SQL CHARINDEX Function to find the ‘ ‘. so that the end point will be before the space. Next, we used the SQL CHARINDEX Function to find the empty space, and then we added 1. so that the starting point will be after the empty space. SET @Destination means we are extracting the word starting at 0 index and up to empty space. That will be the first word. Once we got our first word, we will remove that word from @Source using the SET @Source code. Although the above example will return the result, we just want to wrap it in the User Defined Function. I suggest you to refer User Defined Function article for better understanding. We can find the user defined function in two ways. Please navigate to the Database that contains the function -> Programmability -> Scalar-valued Functions -> function name. Next, right click on the function will open the context menu. Here, please select the option as we shown below.